I have used this saw in commercial home restoration for ten months, and, although the torque is a little whimpy, it has worked nicely for me - until it broke. However, I cannot be even this positive about Panasonic warranty support. 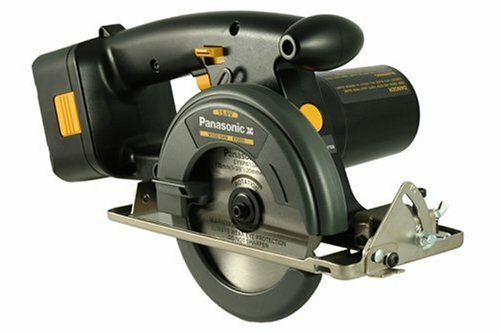 Although this saw is very expensive, I bought it because I wanted a battery operated saw, and I wanted to stay compatible with Panasonic's great batteries. (I already own two Panasonic EY6432 15.6 volt drills as well as the EY6535 multi-driver which are truely great tools that hold up well under commercial use.) The wood saw stalls fairly easily, but it will saw 2x4s and even rip 1 inch boards effectively if you guide it straight to avoid binding. It is very light making it especially handy for sawing trim with one hand while hanging off a ladder. However, it has a plastic body that has a narrow section right where it attaches to the base. One day the body broke right at this narrow section. Mind you that this saw may have been dropped from normal working height, but it was not mistreated or dropped from a roof. However, Panasonic refuses to fix it under warranty. Their treatment of customers is impersonal and unsupportive. The saw is a LEFT HAND saw!!! Study the pictures and think about it. Every time I am in a pinch and need a cordless saw I lament the left-handedness of my Pano. The body is in the way and it is near impossible to see your lines (it's like the entire engineering dept. at Panasonic dropped the ball... or are all left-handed). Now my poor Pano saw just roughs out ply shims/spacers and cuts cement board. The drill is fantastic. So much so that I am constantly having to retrieve it from the other guys who own other brands of cordless drills. The saw is for lefty's. If that's you, this combo kit or saw is a dream come true.